What is the stroke volume? This stroke volume calculator will help you determine the amount of blood that is pumped by your heart in a single beat. This value is often used in anesthesiology to measure the recovery after anesthesia. If you wonder how to calculate the stroke volume manually, make sure to check out the stroke volume equations provided below. Stroke volume is the amount of blood pumped by your heart in every beat. Each time a ventricle contracts, it pushes blood from the heart to the aortas and towards the rest of the body. If you remember the definition of the cardiac output, you already know that it is the volume of blood pumped by the heart during one minute. It is easy to convert this number into stroke volume. All you have to do is to divide this number by the number of beats per minute, called the heart rate. The regular values of stroke volume are between 60 and 120 mL per beat. Of course, your heart rate will vary depending on the level of physical activity. This way, your stroke volume will also increase. Normal level of training can cause your stroke volume to reach about 120 mL; if you are an athlete, you can expect numbers as high as 200 mL. 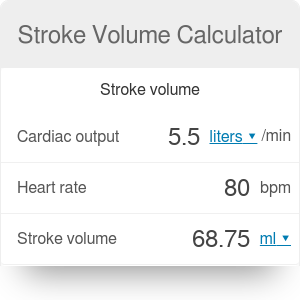 You can also use this stroke volume calculator to find the stroke volume index, normalized with respect to the body surface area (BSA). This way, you can easily compare your result with someone who has a different body type. Stroke Volume Calculator can be embedded on your website to enrich the content you wrote and make it easier for your visitors to understand your message.